Sally and I just took a driving trip from New York City to San Francisco. To avoid unanticipated snow storm in the northern part of the country and to tour different parts of the country, we took the long way. We drove down the Atlantic coast to Florida, then westward along the Mexican border, and up the California coast. The whole trip clocked 5,000 miles instead of 3,000 mile by the direct route. We drove four hours each day, toured the local sites, and checked into a motel for the day. The whole trip took three weeks. The trip was peaceful and safe, and we found nice friendly people everywhere we went. But we saw signs of potential dangers and cautions. 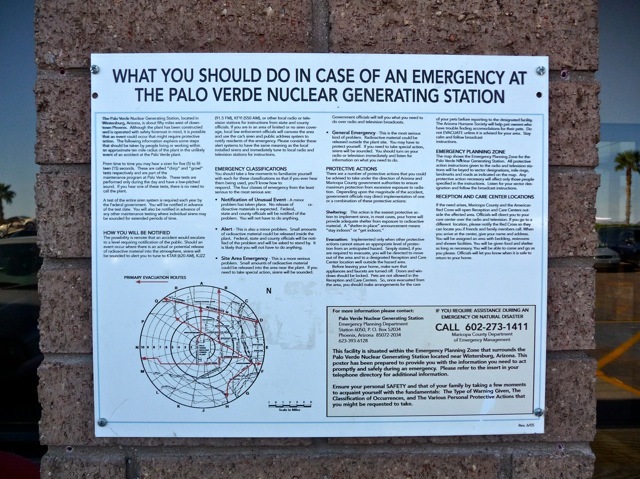 By the Palo Verde nuclear research site in Arizona, we saw this instruction notification on what to do in case of a nuclear emergency. In view of the Japanese nuclear disaster, this notice had particular poignance. Many Americans own and carry guns. 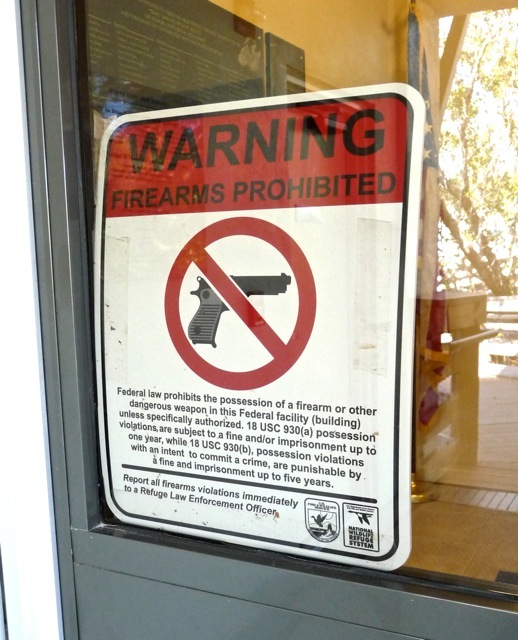 This notice on the door to a federal government building reminded visitors to leave their guns out. 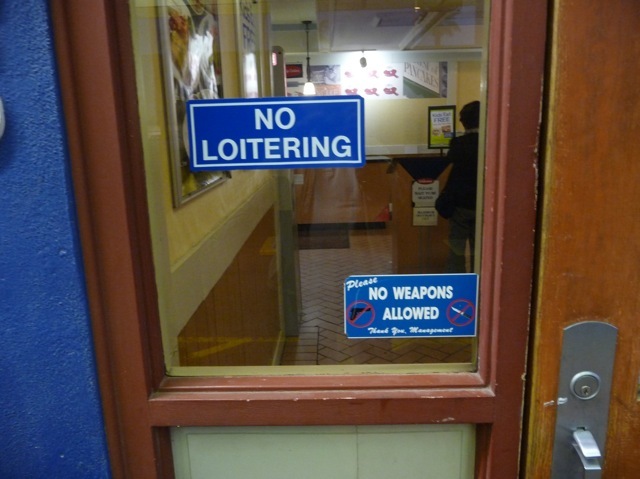 Even gasoline stations disallowed all kinds of weapons in the building. It makes one wonder how many guns and knives are carried by Americans. 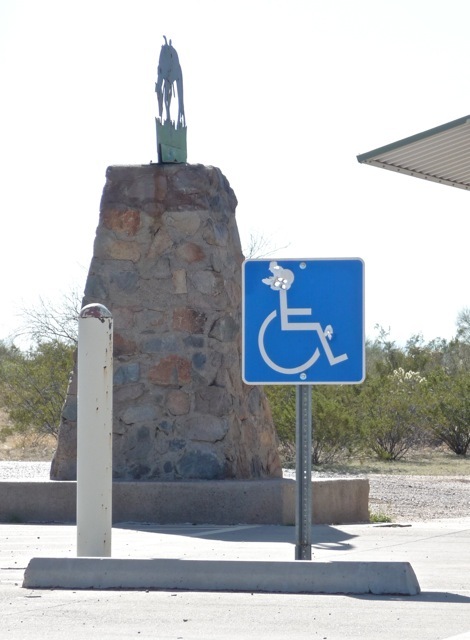 At a highway rest stop, reserved parking spaces were available for vehicles carrying the disabled. This Texas sign put a cowboy hat on the person on the wheelchair. Gun toting travelers put four bullet holes in his head. 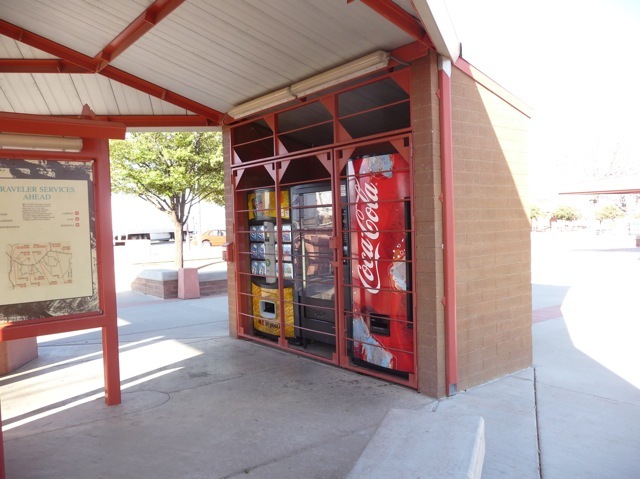 Vending machines in highway rest stops were locked behind bars. Apparently the bars were not used to punish the vending machines for selling junk food, but to keep them from being stolen. 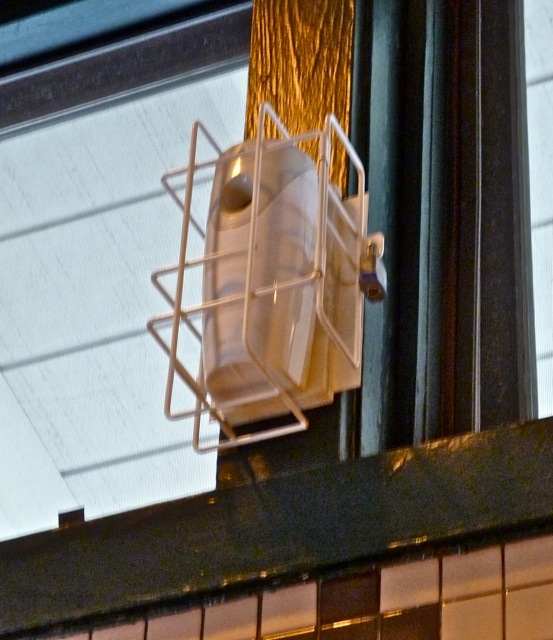 Even air freshener in public toilets were locked to keep them from being stolen. 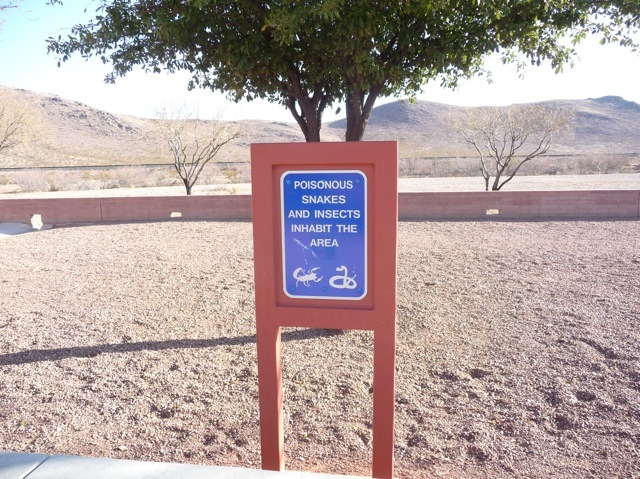 Besides hazards from humans, the tourists were warned about poisonous snakes, scorpions, and other dangerous desert insects. Other than little lizards, we encountered nothing unusual. 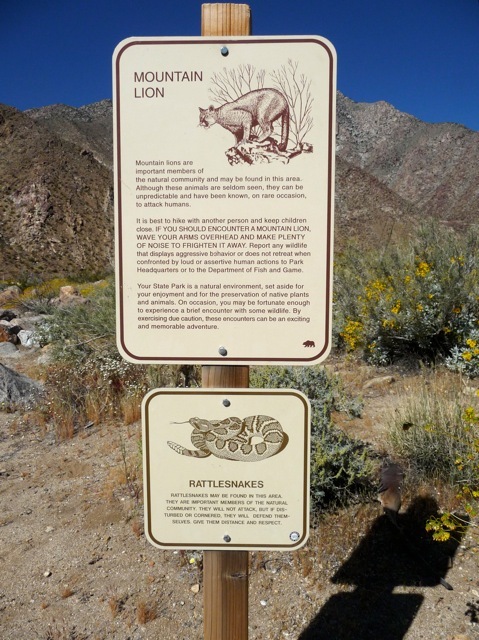 In one desert state park, we were warned to watch out for mountain lions and rattle snakes. 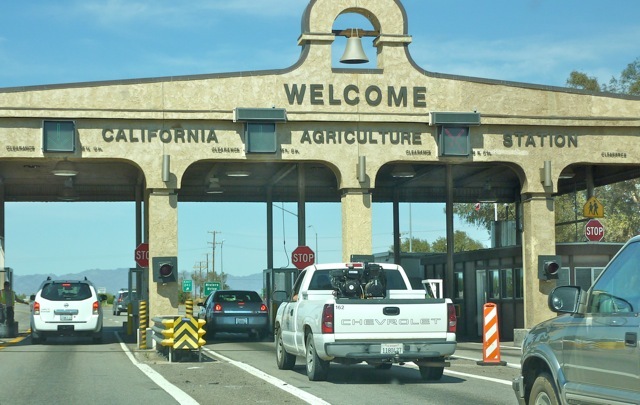 To keep unwanted vegetations and pests from entering California, all vehicles entering California were checked for vegetations. 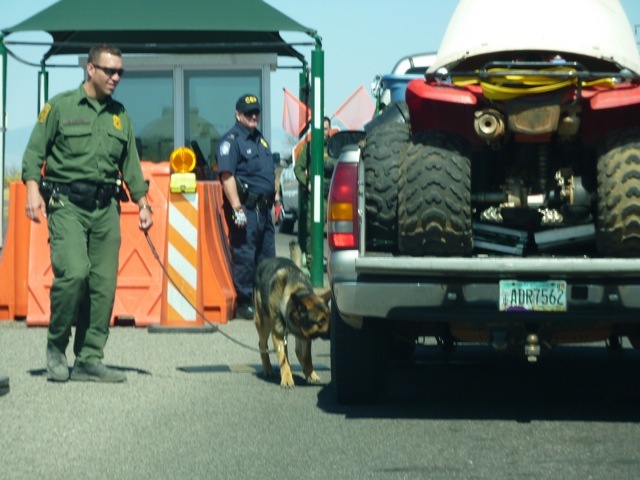 Near the Mexican border, check points were more serious as dogs and armed guards checked for drugs and illegal immigrants. We only encountered nice, courteous, friendly people for three weeks. 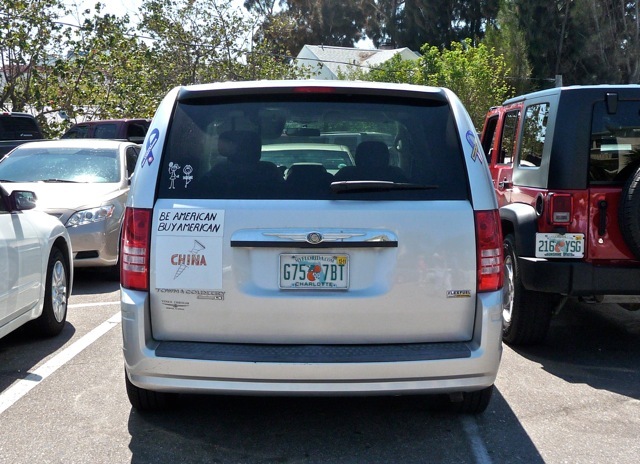 But there was an underlying sentiment against China as shown by the sign on this vehicle. 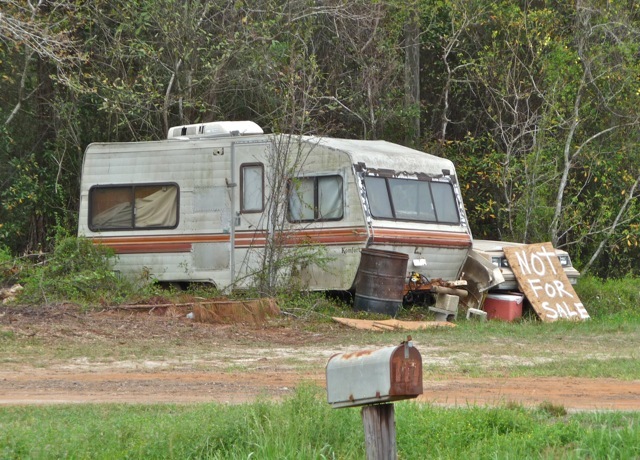 The owner of this derelict trailer camper was probably tired of enthusiastic inquiries about his prized possessions. His tongue-in-cheek sign made sure everybody knew his intention to keep his junk. 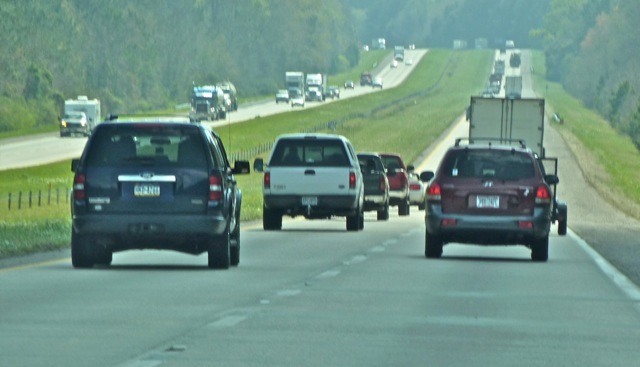 Americans’ love affair with big SUVs was amply demonstrated on this stretch of highway filled with gas guzzling SUVs and recreational trucks. 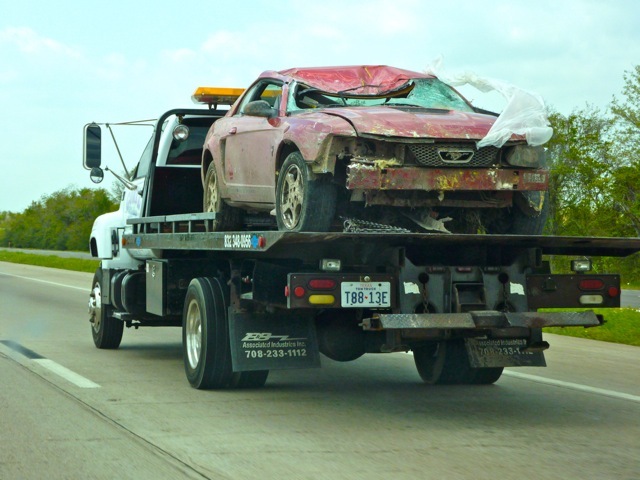 One muscle car met its doom. 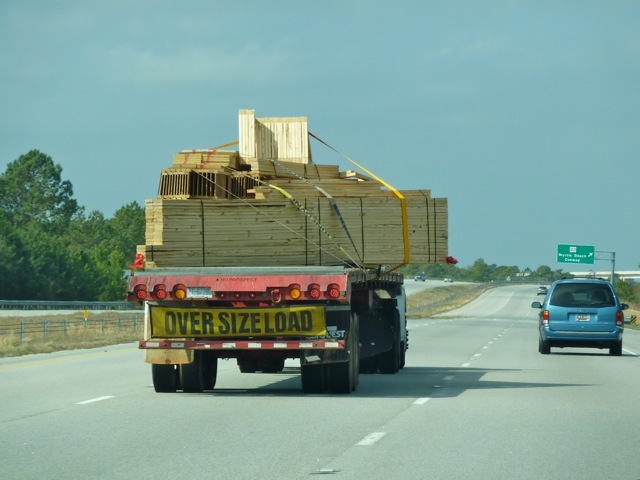 Other hazards to watch out for on highways included protruding load from a truck. 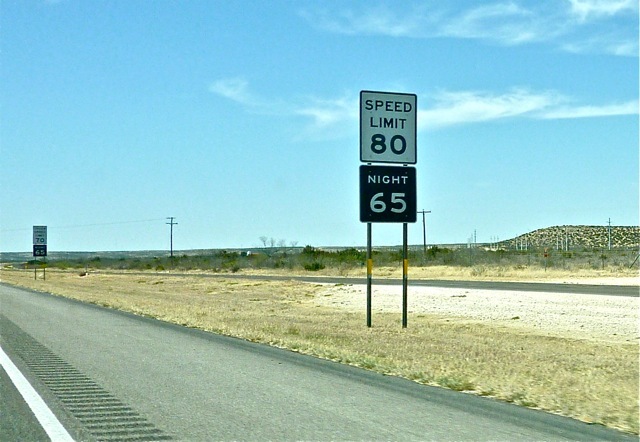 On the excellent interstate highway system, parts of the road had speed limit of 80 MPH for cars and 70 for trucks. Gasoline consumption rise exponentially with high speed, so these high speed limits costed lots of money. 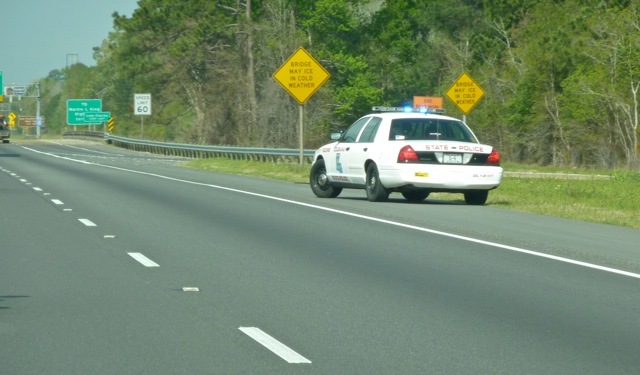 But the speed limits were strictly enforced by many police cars. 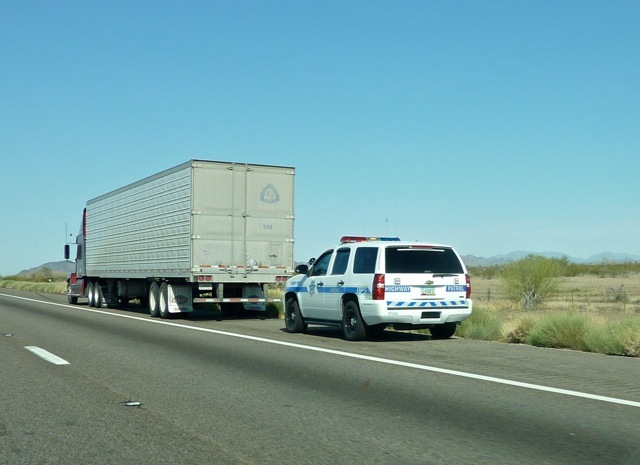 This one waited on the shoulder and the policeman was probably checking traffic speeds with his radar gun. 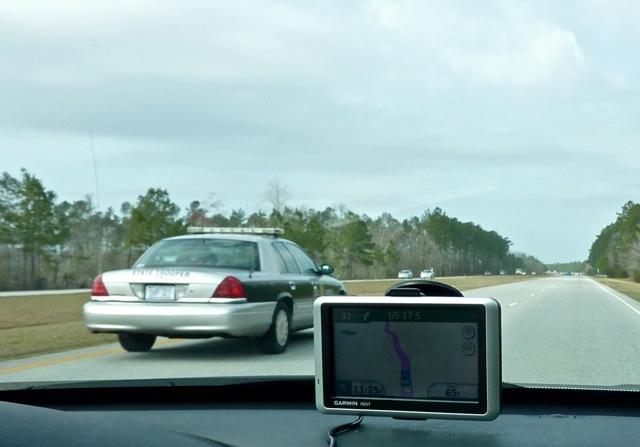 In some states, radar detectors to detect police radar gun signals are illegal. This police car passed by my car. He obviously recognized my GPS navigational instrument on my dashboard and did not interfere with me. 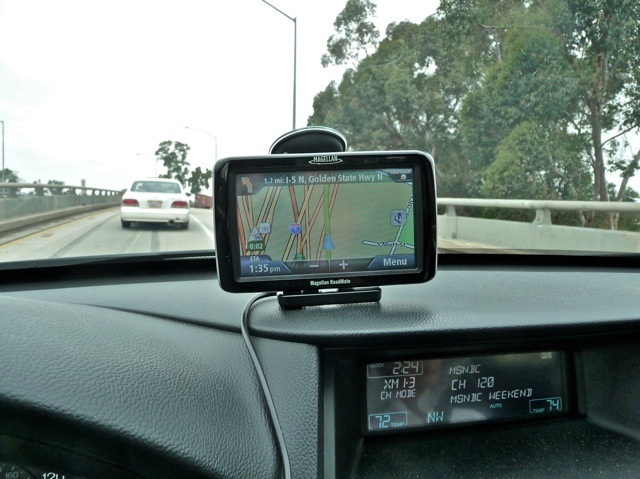 My GSP navigation tool was indispensable on this long trip. Without it, I would have been completely lost among the mess of spaghetti of roads. A few big 18 wheelers were driven carelessly. This one was stopped by police before it could cause gigantic damage. Offenders could be sent to jail. 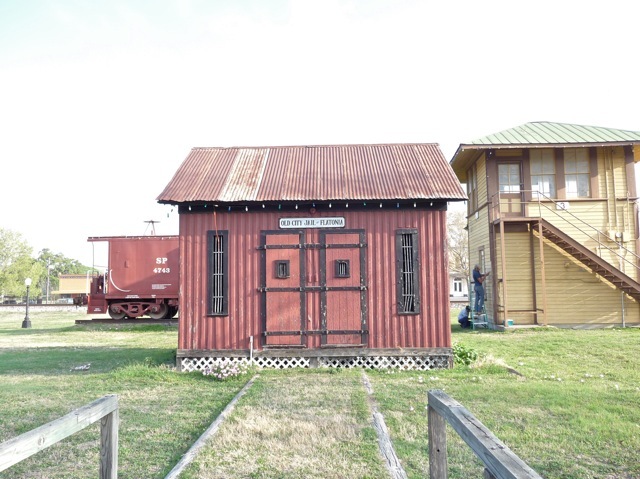 But not to this 100 year old jail house in a small railroad town. Intimidated by all these hazards, warnings, and law enforcement, I followed the rules carefully. 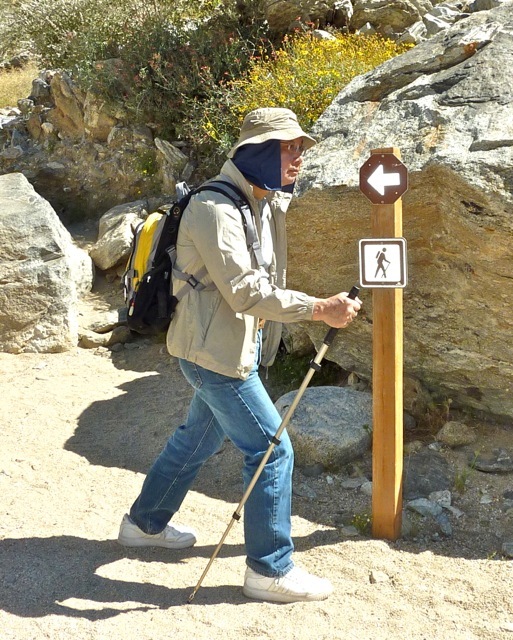 When I walked the trail in a desert canyon, a sign instructed me how to walk. I obligingly followed the posture faithfully. Posted by Robert Wu on Sunday, April 3, 2011, at 7:09 am. Filed under Uncategorized. Follow any responses to this post with its comments RSS feed. You can post a comment or trackback from your blog.